Efforts to determine how many birds are killed by the project involve carcass surveys of only 29% of the project area and do not involve significant searches of the desert surrounding the Ivanpah Solar project's boundary. According to the 2014-2015 Winter Report for the Ivanpah Solar Electric Generating System Avian & Bat Monitoring Plan, (covering 21 October 2014 to 15 March 2015), seven birds with singed feathers were found far from the power towers, including four found on or near the fence line, almost a half-mile from the power towers where the heat is most intense. Previous reports assume most, if not all singed birds fall to the ground in the immediate vicinity of the power towers. Two of the singed birds were ravens found incidentally – not during the systematic carcass surveys - still alive with heavily scorched feathers. One of the ravens was found on the fence line, and another was found in a logistical yard in between Units 1 and 2, indicating that both birds traveled over a half mile before falling to the ground, even with what the report describes as “severe singeing” of flight feathers. The ravens were found still alive but unable to fly. Based on the incidental find of these two ravens, it seems highly likely that other birds singed by the project travel outside the perimeter of the bird carcass surveys and die undetected, representing an unknown portion of the project related mortality not accounted for in mortality estimates. The map below shows the birds found dead or injured near Unit 1 (of 3) of the Ivanpah Solar project during the winter. The two ravens found with burned feathers are depicted in the map as "CORA" (common raven) in the upper right hand corner of the heliostat field, and far upper left hand corner of the map. The solar power tower is located in the center of the heliostat field outlined in blue. 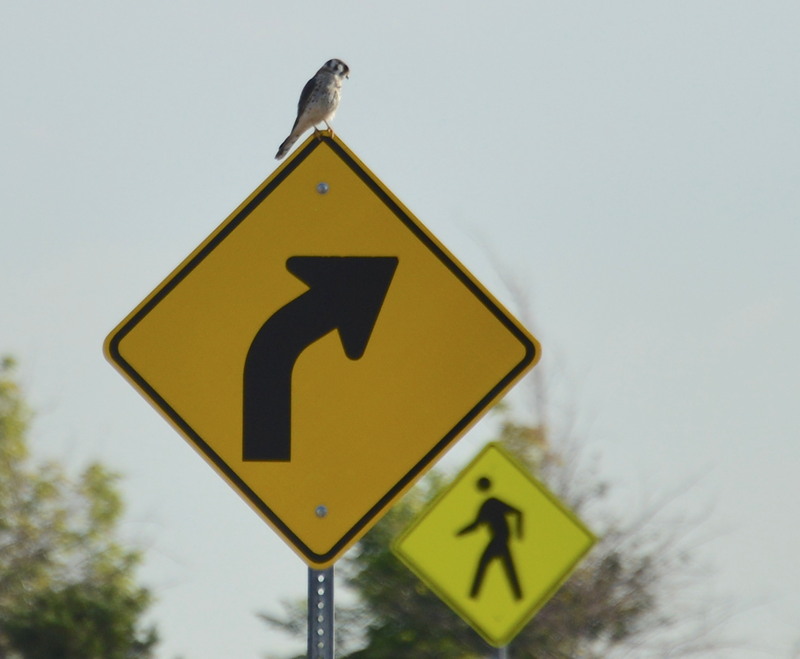 The two other birds found dead near the fence line were located during carcass surveys and include an American kestrel and a Northern harrier hawk. The report speculates that these bird carcasses may have been moved further from the power tower by scavengers. This seems to be a premature conclusion, especially considering that two ravens managed to fly over a half-mile from the power tower before falling to the ground where they were found still alive by workers. An American kestrel, pictured above, is a relatively small bird. If the singed kestrel found dead this winter at Ivanpah traveled nearly half a mile before falling to the ground, it suggests that bird species of various sizes travel beyond the project boundary before dying, and remain undetected by surveys. Two ravens - larger than a kestrel - managed to fly much further than the kestrel, according to the winter report. These singed birds found far from the power tower remain just a fraction of the current mortality detected at the Ivanpah Solar power tower project. Searches from 21 October 2014 to 15 March 2015 found 340 birds and 3 bats dead or injured within the project fence line. Based on these detections, the report estimates that the Ivanpah Solar project killed over 2,000 birds this past winter. Although the report determined that over 600 died from singeing or collision with heliostats, the cause of death remains unknown for as many as 1,373 of the birds. 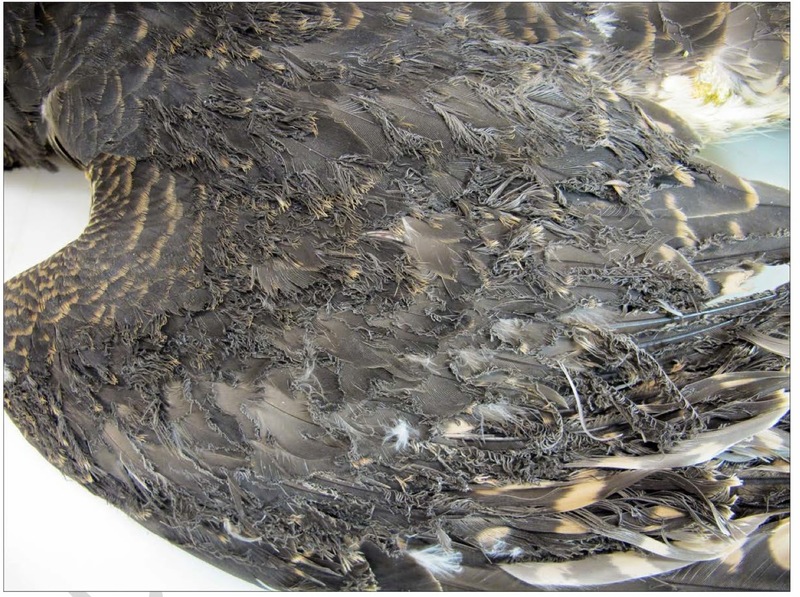 It is likely that many of the bird deaths classified as “unknown” were caused by collision with the mirrors or intense heat above the mirror field, although wildlife experts are still trying to determine the various ways in which the project harms avian species. The singed feathers of a peregrine falcon burned by the Ivanpah Solar project. This bird was found alive in September 2013, but later died from injuries. The report of this bird's death lacks details, but does mention it was found near "fencing," suggesting it may have also made it a far distance from the power tower before falling to the ground. The studies are still a far way from discovering the full range of impacts on avian wildlife. Not all birds affected by the solar project's heat will end up with singed feathers. Experts believe that the most intense heat near the power towers causes singed feathers, but birds flying throughout the rest of the project are exposed to elevated heat that may cause death without damaging feathers. 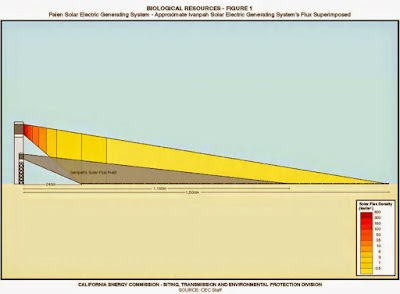 This image, submitted by the California Energy Commission staff during consideration of a separate solar power tower project, shows that the most intense solar flux (heat/energy levels) exist close to the power tower (in red), but the rest of the project area also has high "solar flux" that can stress or injure wildlife. The winter report also cast light on a high rate of mortality for roadrunners. Surveyors found 25 dead roadrunners, suggesting dozens more likely died on the project site during the winter months. The report indicates that the cause of death for the roadrunners is unknown, but collision with mirrors and exposure to solar flux seems less likely since the birds usually stay close to the ground. 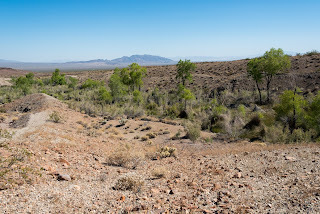 Minutes from a recent Technical Advisory Committee meeting for the Ivanpah Solar project indicate that officials are considering whether the fence line of the project may be trapping roadrunners inside, but it is not clear whether researchers fully understand why roadrunner mortality has spiked at the project site. Nonetheless, the data underscore how little we know about the destructive impacts of such large solar facilities built on desert wildlands. With other solar technologies able to generate clean energy more efficiently and with far less impact on wildlife, solar power tower technology is not worth the ecological cost. Proponents of the solar power tower industry argue that this technology offers an opportunity for energy storage that is badly needed by utility companies. But the storage capacity of solar power tower projects is likely overrated by proponents. 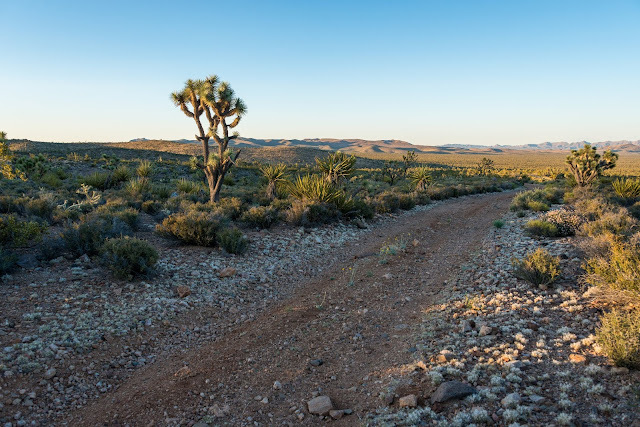 Evidentiary testimony during the California Energy Commission review of the Palen solar power tower project indicates that the technology may only be capable of providing stored energy for a 15 minute period, and only with the assistance of natural gas-fired boilers. Considering that photovoltaic solar panels installed on rooftops or already-disturbed lands can be paired with battery storage without burning birds to death, solar power tower technology is struggling to maintain relevance in renewable energy technology and design. 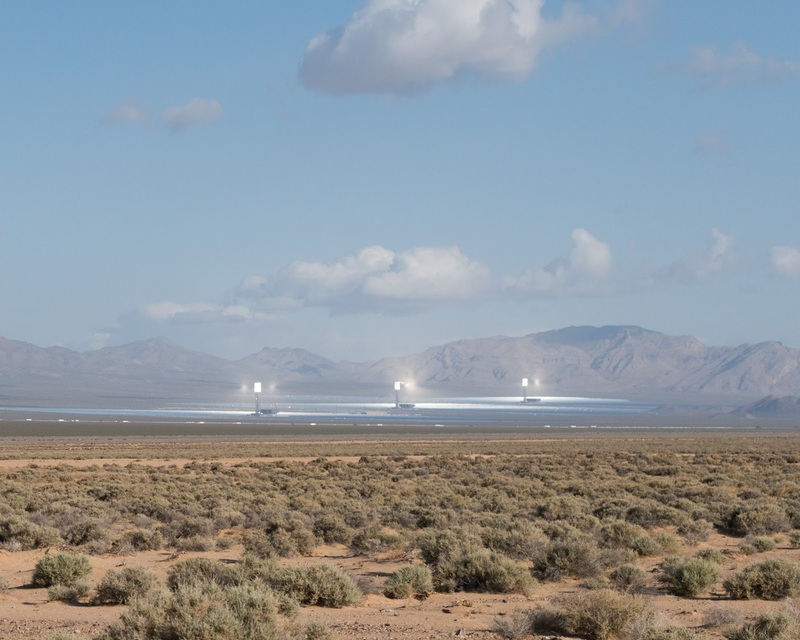 Just this month, Abengoa decided that it would no longer pursue a power tower design for the Palen Solar project, looking instead to use solar trough technology. Abengoa clearly recognized that the benefits of solar power tower technology are weak compared to the alternatives, indicating in its letter to the California Energy Commission that the decision to abandon power tower technology was made after an evaluation of California's "future electrical reliability needs." And that's coming from the profit-driven industry perspective. From a sustainability perspective, the choice is much clearer. How can a project be green when it burns natural gas, burns birds, barely generates solar energy, and bulldozes intact desert habitat? 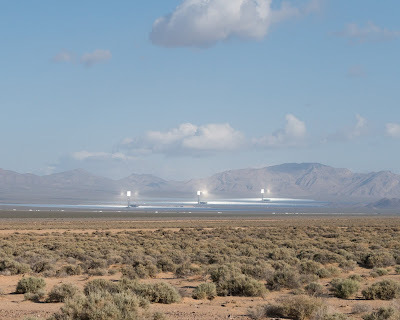 All three units of the Ivanpah Solar project can be seen in this photo, taken miles away from the facility. 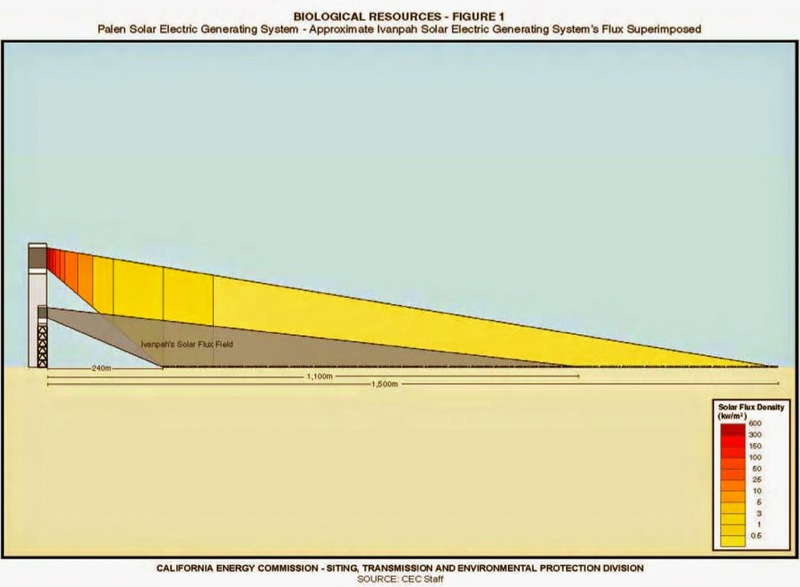 The bright glare next to each of the three power towers is the most intense portion of solar flux that can burn avian wildlife, although the air space above the entire project likely contains elevated levels of flux. 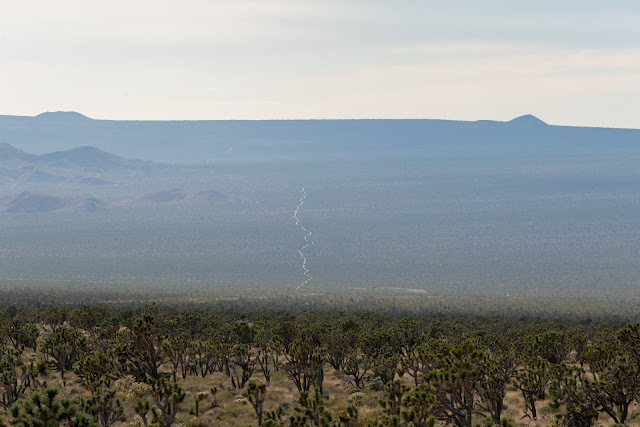 The Ivanpah Solar project destroyed 5.6 square miles of intact desert habitat.